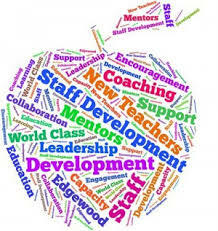 Kimball Schools seeks to provide high-quality professional development opportunities to all staff, licensed and non-licensed. Opportunities focus on improving instruction, as well as increasing student learning and success. A 10-person committee meets monthly to plan upcoming staff development opportunities and approve scholarship requests. The committee is made up of administration, licensed representatives from each building, and a non-licensed representative. The committee is led by Staff Development Coordinator Nancy Bonnifield.